← Doug Hendren: Fracking is Everywhere; We’ve got gag orders, no tape recorders, … ‘Cause the judge says that it ain’t legal, Walking ‘round, talking to people. Why is Alberta media giving so much attention to a fallen from grace ex judge that Harper made so powerful? Why no reporting on the recent 3.8M earthquake and others in the frac frenzy at Fox Creek? Alain Hepner has filed his final written submission to the Law Society of Alberta on behalf of Camp, who stepped down from Federal Court in March following a Canadian Judicial Council recommendation that he be removed from the bench. The council called Camp’s behaviour during a 2014 sexual assault trial “profoundly destructive” and said it undermined public confidence in the judiciary. “The sole issue before this panel is whether Mr. Camp should be reinstated as a member of the Law Society of Alberta, with an emphasis on the public confidence in regulating our own profession,” Hepner wrote in his submission which was obtained by The Canadian Press. The law society is still mulling over Camp’s application. Camp told the panel in November that he believes he’s a better person now, having taken steps to educate himself on the history of sexual assault law in Canada and to correct previous biases. He said he has taken on three counsellors to help guide his legal and personal development. 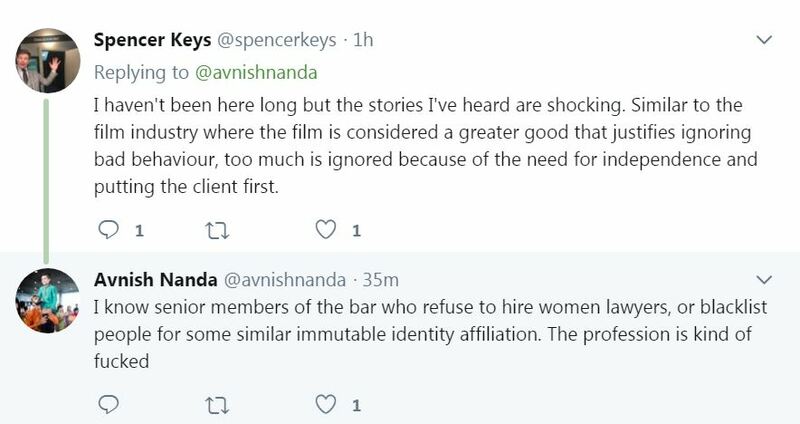 It would be interesting to watch him in any Court defending an accused before any Judge that respects women. This can happen in Civil Court as easily as in a Criminal Court. Thanks for the PSA @TabathaSouthey. 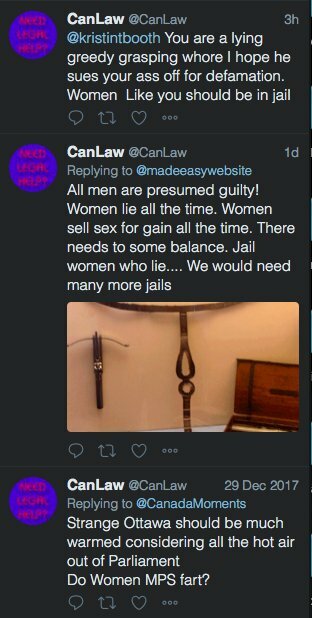 I followed this account but had never seen this kind of abusive, misogynistic crap until you pointed it out. I’ve now unfollowed and I urge all my lawyer colleagues to do the same – and to invite your followers to do so as well. Over the past few years, public attention focused on the Jian Ghomeshi trial, the failings of Judge Greg Lenehan in the Halifax taxi driver case, and the judicial disciplinary proceedings against former Justice Robin Camp have placed the sexual assault trial process under significant scrutiny. Less than one percent of the sexual assaults that occur each year in Canada result in legal sanction for those who commit these offences. Survivors often distrust and fear the criminal justice process, and as a result, over ninety percent of sexual assaults go unreported. Unfortunately, their fears are well founded. 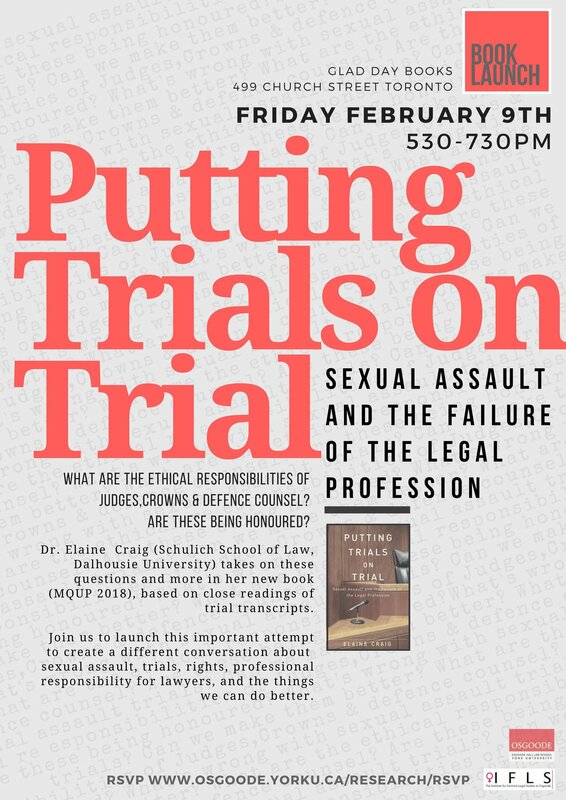 In this thorough evaluation of the legal culture and courtroom practices prevalent in sexual assault prosecutions, Elaine Craig provides an even-handed account of the ways in which the legal profession unnecessarily – and sometimes unlawfully – contributes to the trauma and re-victimization experienced by those who testify as sexual assault complainants. Gathering conclusive evidence from interviews with experienced lawyers across Canada, reported case law, lawyer memoirs, recent trial transcripts, and defence lawyers’ public statements and commercial advertisements, Putting Trials on Trial demonstrates that – despite prominent contestations – complainants are regularly subjected to abusive, humiliating, and discriminatory treatment when they turn to the law to respond to sexual violations.